EZH2 antibody recognizes histone-lysine n-methyltransferase EZH2, also known as enhancer of zeste homolog 2,or lysine N-methyltransferase 6. This antibody has been extensively validated for western blotting using whole cell lysates. Mouse anti Human EZH2 antibody recognizes histone-lysine N-methyltransferase EZH2, also known as enhancer of zeste homolog 2 and lysine N-methyltransferase 6. Encoded by the EZH2 gene, histone-lysine N-methyltransferase EZH2 is a member of the Polycomb-group (PcG) family. PcG family members form multimeric protein complexes, which are involved in maintaining the transcriptional repressive state of genes over successive cell generations. This protein associates with the embryonic ectoderm development protein, the VAV1 oncoprotein, and the X-linked nuclear protein. This protein may play a role in the hematopoietic and central nervous systems. Multiple alternatively splcied transcript variants encoding distinct isoforms have been identified for EZH2 (provided by RefSeq, Feb 2011). 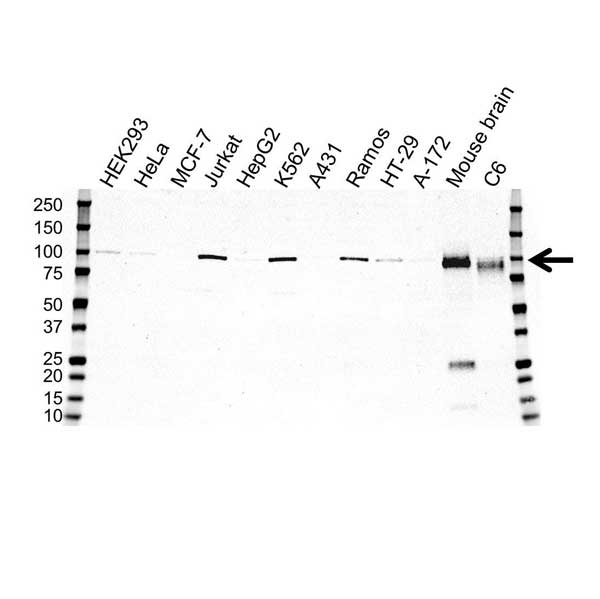 Mouse anti Human EZH2 antibody detects a band of 98 kDa. The antibody has been extensively validated for western blotting using whole cell lysates.